Unfortunately a common problem with our beloved Prowler is that the power door window mechanism seems to malfunction at some point. Fortunately Chrysler is still providing replacement kits for this problem, at least for now. These are hard to get and often on national back order. Get one now before they are gone for good. Drivers and Passengers' Side regulators normally in stock. This item is for one regulator. *Drivers Side currently not available from Chrysler. 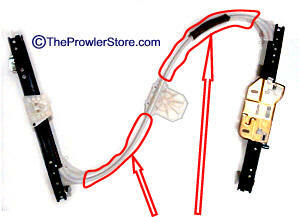 We highly recommend that if you are installing a new regulator that you purchase the Repair Kit below. By installing this on your new regulator you will guarantee it will never break again. 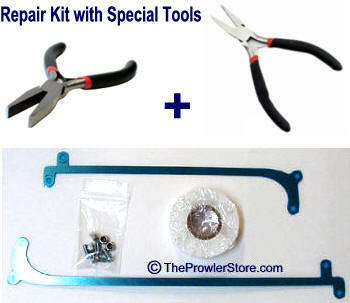 We recommend you put the Repair Kit on both door regulators. Stainless Steel Kit - will never rust! A Permanent Fix! Fix your broken one or install now to prevent a break! **Fixed for the life of your car! Good News is - It is fixable with the right parts. 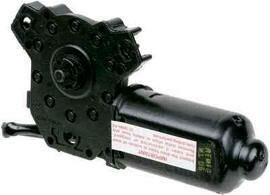 Brand NEW Door window regulator motor. Not included with the door window regulator above. Drivers and Passengers' Side regulators in stock.